Up here in dem boonies, we heats with wood. Ok, enough of that dialect. But yes, we heat with wood. We don't have enough land and time to harvest and split our own (although we do a little culling here and there, and will more next year). We buy it. Over the years, I've gotten pretty good at stacking it and covering it with tarps. On the other hand, over the years, the tarps have developed holes. In my wanna-be-irregular thriftiness, I don't replace the tarps perhaps as often as we'd find useful. So this year, we (by which I mostly mean my husband and brother-in-law) built a woodshed. This is a little taller than we'd intended (thanks to my brother-in-law's powers of persuasion). It is in fact (despite the picture) plumb, but as I'm often not, neither is the image... It'll hold about 5 cords, which is about what we burn in a winter, give or take. It will have some pallets for flooring, presently, and eventually (this year?) 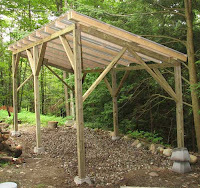 we'll add slatted sides for better weather protection.